TIOcoop Mod can play maps made for BHD, BHDTS and maps made through the Mods Mission Editor. If you use the Medic Mod, you need to re-move the Medic Mod from your game folder or re-name it before you play any of our Mods. If you do not re-move or re-name the Medic Mod and you try to join a TIOcoop Mod server you will be punted automatically. A new look and layout to the game menu, new fonts, new continuous menu music, new Intro Video and a drum roll when entering a map. AI will run left and right, roll left and right, go prone, dive to prone, stoop and walk, crawl forwards and sideways, draw backward and sideways, Knee and shoot, walk and shoot, run and shoot, shoot from prone, jump better and have some other styles of running. New AI - There are AI that throw knives, grenades and flashbangs, A deadly flamerthrower AI, Four wounded soldiers laying on the ground with bodies that twist and flinch from the hips. Three skeletons - One all messed up, Three zombies - one crawls, another zombie walks and the other walk/runs real weird. You will hear many different weapon sounds coming from the AI. You will have AI going prone, you think you killed them, you turn or go and see and they rise to a crouch and shoot you dead. Some AI will shoot you and then come up and Tea Bag you. Others will kill you and come over and put a few shots into your corpse for good measure. New uniforms for player characters, New character faces, Player character speed has increased. You will see many different FX, All splashes, ripples, wakes, fountains, bubbles and sprays will have a light blue look. Explosions will have a different coloured thicker smoke and the explosion flames will have a different look and shape. There will be FX giving your map Flying Moths, Butterflies, Fireflies, Mosquitos and Jumping Bugs. Bigger and better electrical sparks, Bigger killzones for explosions and debris spread to match. Other FX - Fog Mist, Stars, Blinking Stars, Lightning, Large Dust Storms, Intermittent Dust Storms and a Nuclear Explosion Effect. Most of the original BHD sounds have been refreshed and hundreds of new sounds added. Hundreds of dialog waves for SinglePlayer maps. Seven Assualt Rifles, Five Sniper Rifles, Two Machine Guns, Five Hand Guns, Three (Stinger, Mortar, AT4) Launchers, Satchel Charge. Flamethrower, Molotov Grenade, Throwing Knives, Flare Gun, Timer Satchel (Timer Satchel is non selectable, it's always carried). Thermite Flat Pack (Thermite Flat Pack is non selectable, it is a subclass to the Satchel Charge). An update to the Stinger Missile Launcher, AT4 and Flare Gun (longer lasting Green Flares). Donated to TIO and new to BHD is a Mobile Chinook with Armoury and a Mobile Technical with Armoury. Updated Winter foliage, Heaps more Jungle and Desert foliage, New foliage for Volcanic Theme. Jungle Huts, Jungle Structures, more City and Desert buildings, more Winter buildings and Volcanic buildings. Alot of new skins for buildings ( A lot of Skins are not too far removed from the original). A Volcanic Theme has been added. Volcanic terrains, buildings and Rubble, Foliage, Rocks, Lava flows and Erupting Volcano Effects. Exploding Fire Barrel, Large Food Crate, C130 Plane, Three Team Sabre Large Oil Tanks, Fountain, Double Telegraph pole, Coffee Table, Small Field Armoury, 16ft Mesh Fence section. The Large Group of Grass catches fire and burns, leaving a clear field of view. There is much much more then what is stated above, it's a mappers paradise and a great revisit for all players, especially for players who enjoy Co-Op. Our aim with this version is to try and slow down the run and gun style of play and make you use a more tactical approach. Now that the AI are smarter, sharper and have weapons to match, your game play has to change. If you advance to fast you will die. We have a "No AI Re-Spawn" policy in our maps made for our TIOcoop92. So once you have battled hard for that ground, it's yours, no AI re-spawn. Our 92 test server has sixty maps in rotation, all with no AI re-spawn. You are able to install our Mod with BHD only or with BHDTS installed on your computer. 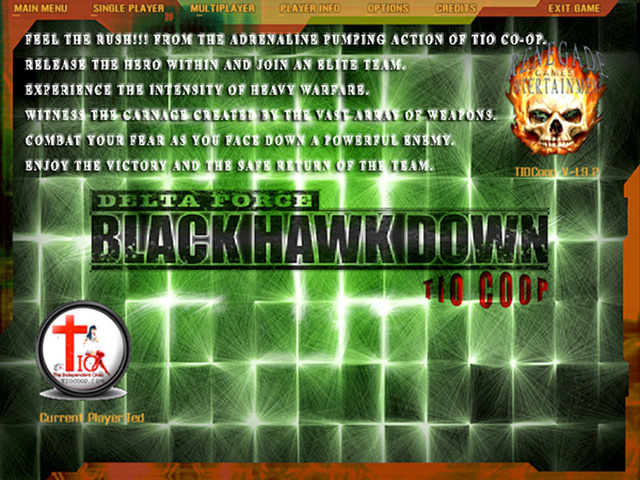 Both BHD and BHDTS players can join a TIOcoop Mod server and play together. It does not matter what game type map is being hosted. Our Mod is a BHD Mod and when hosted on Novaworld it will display as a BHD server. If this Mod generated enough interest, we would consider converting it to a Mod for all game type and not just Co-Op.